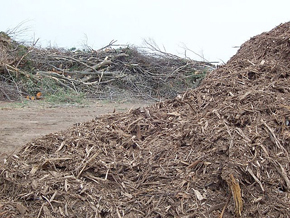 For the cost of just $1 per bag, you can bring your paper or plastic bags of yard waste to us. For brush, see the price list of tip fees and truck sizes below. PLEASE, no trash of any kind in bags or brush. Facility Hours: Monday - Saturday 8 - 5, Sunday 10 - 3. Closed on holidays. Winter Hours: Monday thru Saturday 10 am - 3 pm. Open, weather permitting. Closed Sunday. For location see our contact page. 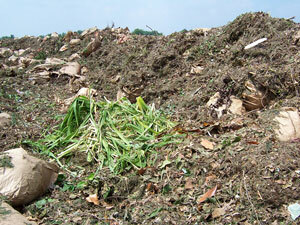 The two slideshows below detail our thorough compost and mulch making processes. 2. 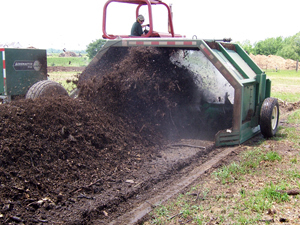 Compost production through aeration and water. 4. Just before final screening. 1. Ground brush ready to dye. 2. Begin the coloring process. 3. Water is added to the pellets of organic dye. 4. Curing the mulch until ready for purchase.